Happy Solemnity of the Sacred Heart of Jesus! This is one of our most favorite feasts. It dates back to the 11th century, but is now most commonly associated with Our Lord’s revelation to St. Margaret Mary Alacoque. 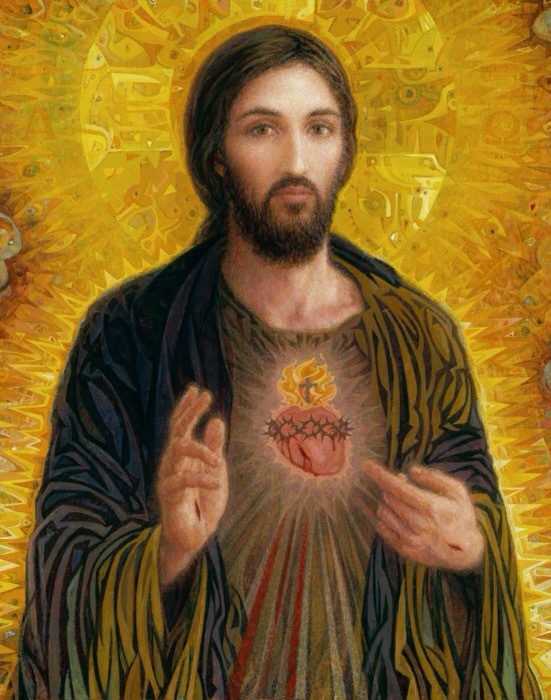 People call it a “devotion”, which makes it sound like an option, but shouldn’t we all be deeply devoted to the Sacred Heart of Jesus, the very Heart of God, Who is so devoted to us? Take thought now, redeemed man, and consider how great and worthy is he who hangs on the cross for you. His death brings the dead to life, but at his passing heaven and earth are plunged into mourning and hard rocks are split asunder. It was a divine decree that permitted one of the soldiers to open his sacred side with a lance. This was done so that the Church might be formed from the side of Christ as he slept the sleep of death on the cross, and so that the Scripture might be fulfilled: They shall look on him whom they pierced. The blood and water which poured out at that moment were the price of our salvation. Flowing from the secret abyss of our Lord’s heart as from a fountain, this stream gave the sacraments of the Church the power to confer the life of grace, while for those already living in Christ it became a spring of living water welling up to life everlasting. Arise, then, beloved of Christ! Imitate the dove that nests in a hole in the cliff, keeping watch at the entrance like the sparrow that finds a home. There like the turtledove hide your little ones, the fruit of your chaste love. Press your lips to the fountain, draw water from the wells of your Savior; for this is the spring flowing out of the middle of paradise, dividing into four rivers, inundating devout hearts, watering the whole earth and making it fertile. Run with eager desire to this source of life and light, all you who are vowed to God’s service. Come, whoever you may be, and cry out to him with all the strength of your heart. “O indescribable beauty of the most high God and purest radiance of eternal light! Life that gives all life, light that is the source of every other light, preserving in everlasting splendor the myriad flames that have shone before the throne of your divinity from the dawn of time! Eternal and inaccessible fountain, clear and sweet stream flowing from a hidden spring, unseen by mortal eye! None can fathom your depths nor survey your boundaries, none can measure your breadth, nothing can sully your purity. From you flows the river which gladdens the city of God and makes us cry out with joy and thanksgiving in hymns of praise to you, for we know by our own experience that with you is the source of life, and in your light we see light. This entry was posted in Uncategorized by texasnuns. Bookmark the permalink.